When I look up the process in task manager, it shows PID 4 is SYSTEM, that's it. No extension... nothing. Just "SYSTEM". What's going on here? I'm afraid to end this process, what do I do? I've solved this through another Stack Overflow question, which had the solution to get IIS to stop listening on port 80 for a specified IP address. A new service called "Web Deployment Agent Service" (MsDepSvc) can also trigger "System" with PID=4 to listen on port 80. Also, try stopping "SQL Server Reporting Services (MSSQLSERVER)", that apparently defaults to 80. I did that and port 80 freed up. PID identified the culprit as "System", but apparently that System can mean multiple things. There are many services, which can listen port 80 on windows. To avoid this problem in future go to Local Services and disable listed services. N.B. 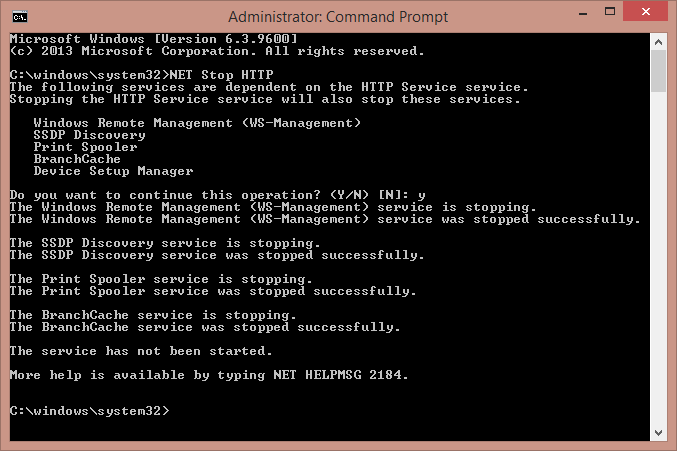 - Some services will restart themselves immediately, just run 'NET stop HTTP' few times. I had the same problem. Could fix it by stopping the World Wide Web Publishing Service under running services. It sounds like IIS is listening to port 80 for HTTP requests. Try stopping IIS by going into Control Panel/Administrative Tools/Internet Information Services, right-clicking on Default Web Site, and click on the Stop option in the popup menu, and see if the listener on port 80 has cleared. Double click Services and Applications. Right click on "World Wide Web Publishing Service". 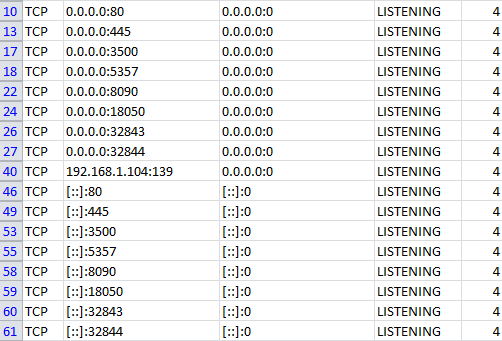 I've found out that "SQL Server Reporting Services (MSSQLSERVER)" starts automatically and listens on port 80. RESTART YOUR WEB SERVER/XAMPP/APACHE AND DONE. services.msc showing it as "BranchCache"
I just got this problem today, since it showed up after Norton requested reboot I blamed Norton. But it wasn't Norton, I removed Norton, rebooted -> problem still there. netstat -nao was showing that PID 4 owned my port 80 connection. I then went to control panel, then "Turn Windows features on or off" then unchecked Internet Information Services. Rebooted, the problem went away. My xampp server is running ok now. I don't ever remembering turning IIS on in the first place. I had been running many months before this happened. I still don't know what caused it in the first place. Maybe a previous windows updated enabled iis and my reboot turned it on, I don't know. I had this same exact problem, except that i have never used IIS. While I was fixing another system bug, I had set the apache service to manual start, hoping to reduce the complexity of my system. After I fixed the other bug, apache wouldn't start. I futzed for a while, but all it took was setting apache back to automatic start: Start > Administrative Tools > Services. Apparently when Apache starts this way, it claims port 80 before the SYSTEM process can. hth someone. all my googling turned up the 'can't have IIS and Apache on the same machine.' this is for the other one percent of us. Try netstat -b, that may hopefully shed some light on the situation (showing what .exe is using the port). Good luck. For me it worked after stopping Web Deployment Agent Service. In case you use Razer product and install Razer Synapse software on your PC, it blocks the port 80 too. It is not included in the netstat command so I am not able to troubleshoot it. Since there are many services included within the software, I can't analyze which one that blocks the port. After uninstalling the Razer Synapse, I can start the Apache server again on Windows 10. This wouldn't explain the PID side of things, but if you run Skype, it likes to use Port 80 for some reason. In my case, it happened after installing Microsoft Web Matrix. Uninstalling this trash along with "Microsoft Web Deploy" fixed the issue. None of these worked for me. I had to go to a superuser question: https://superuser.com/questions/352017/pid4-using-port-80. If it is a System Process—PID 4—you need to disable the HTTP.sys driver which is started on demand by another service, such as Windows Remote Management or Print Spooler on Windows 7 or 2008. Go to device manager, select “show hidden devices” from menu/view, go to “Non-Plug and Play Driver”/HTTP, double click it to disable it (or set it to manual, some services depended on it). Reboot and use netstat -nao | find ":80" to check if 80 is still used. I was looking around for PID 4 and came to this question. From this answer and a blog post I figured that anything to do with PID 4 is probably a Windows Service, so you may want to look for the relevant services in services.msc. Also, this process is run by System, which is considered another "logged-on" user. I had the same problem and it was because of IIS running on the server, you can stop it using IIS Manager if it is the case for you. If you are running Windows Server 2012 R2 then make sure to get rid of Work Folders: http://blogs.technet.com/b/filecab/archive/2013/10/15/windows-server-2012-r2-resolving-port-conflict-with-iis-websites-and-work-folders.aspx Removing Work Folders feature under File Server worked for me. PID=4 does not show up in Task Manager even after placing check mark on 'Show processes from all users". Well there is only one user. However, netstat -b shows multiple connections poiting to the same PID=4 which on this computer displayed the following. I have only chosen those pertaining to TCP protocol. This was acquired while trouble shooting IIS which did not start after trying out many others. I do not think you should stop this process. then in IIS manager review each site's bindings settings, by selecting a site and on the side panel click on binding. then change port 80 to something else if required. I stopped World Wide Web Publishing Service and then it worked. Viola u are good to go ! Not the answer you're looking for? Browse other questions tagged iis port pid netstat or ask your own question. How do I free my port 80 on localhost Windows? What does “Can not obtain ownership information” in Netstat -ab mean? How can I change admin port? How to find out what program is listing to port 80 on windows?